The charming Cosmelenia Hotel Apartments provides an ideal place to launch your holiday in Cyprus from. The warm, lapping waters of the Mediterranean Sea is an easy walk to reach with Makronissos Beach being the ideal spot to enjoy them from or simply relax on its fine sand beach soaking in the golden rays of the Cypriot sun. 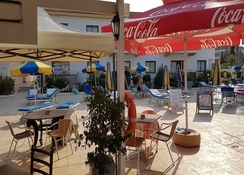 The hotel is a family-friendly place to stay with a restaurant which offers live music and entertainment several nights of the week as well as a swimming pool, café and snack bar. Rooms are comfortable, clean and well-designed with all the basic amenities guests need for a relaxing stay. Take a wander along the main drag and you will find great bars and café as well as shops. A five minute drive will take you into the centre of Ayia Napa where you will find lots of great restaurants and clubs as well as waterparks and museums, a little something for everyone. 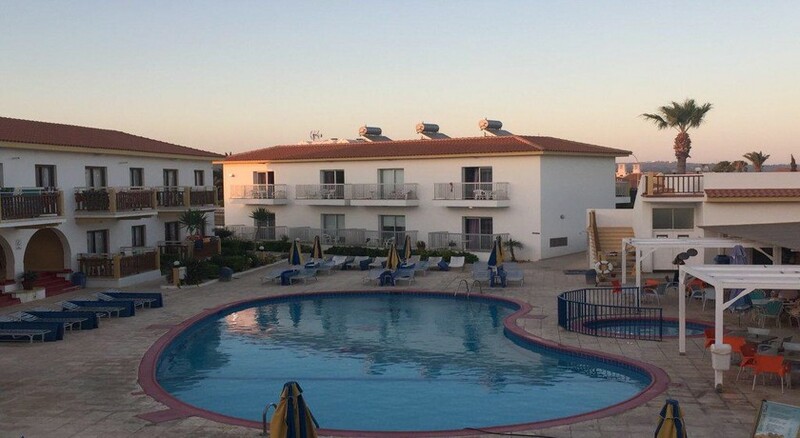 Cosmelenia Hotel Apartments is located in the popular region of Ayia Napa, however it resides a little outside of the centre of the region. The hotel is located just 58km from Larnaca International Airport whilst only 800 metres from the beautiful Makronissos Beach. The Water World Waterpark is just a short walk from the hotel. 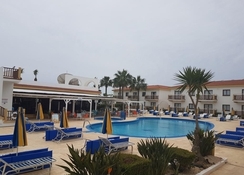 Guests who have come to experience Ayia Napa’s famed nightclubbing scene will find the main hub for clubs located just a five minute drive away. This is also where most shops, restaurants and conveniences such as cash points are to be found. Rooms at Cosmelenia Hotel Apartments are contemporary in design. Their use of light and neautral tones help to maximise the Cypriot sun making for a brighter and more airy atmosphere. There are 34 apartments with 4 studios and 30 one bedroom apartments as well as 8 superior studios. All rooms come with the essential amenities you will need for a comfortable and convenient stay, from private bathroom, wi-fi, tea and coffee facilities, air-conditioning, safe deposit box. The apartments also include a kitchenette allowing guests to enjoy kick back and dine-in in the privacy of their own room. Cosmelenia Hotel Apartments puts on great entertainment for all the family during several evenings a week. Cool off at the hotel pool or the waters of the Mediterranean Sea at Makronissos Beach. The hotel bar is a has live football and pool tables as well as a great selection of cocktails, beers, spirits and wines. Those who have come for Ayia Napa’s clubbing scene will find a host of clubs to keep the party going through the early hours, such as the River Reggae nightclub, Car Wash disco and Soho Club. Combine cooling off with exhilarating fun at the Paliatso Luna Park waterpark or if you want to learn about the rich history of this area of Cyprus then the National History Museum of Ayia Napa is the place to head to providing a foundation for all you will see around you. Two minute walk from Ayia Napa Waterpark.